The information in this report is preliminary and will be supplemented or corrected during the course of the investigation. This report provides an update to investigative activities related to the March 15, 2018, collapse of the Florida International University pedestrian bridge while under construction in Miami, Florida. Since the first investigative update was issued on August 9, 2018, new information on the bridge design has been developed and additional forensic examination/evaluation of bridge structural components has been completed. Personnel from the FHWA Office of Bridges and Structures are supporting the NTSB investigation by providing resources and expertise to evaluate the bridge design and the construction process. 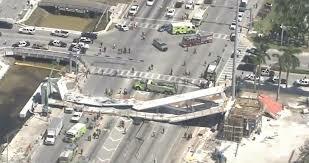 Their review has included an evaluation of the bridge design as it relates to the overall structure and a review of the 174-foot-long span that collapsed onto SW 8th Street (see figure). The FHWA evaluation included an assessment of the available design calculations and construction plans for conformance to appropriate design and construction specifications. Although the evaluation is ongoing, the assessment has determined that errors were made in design of the northernmost nodal region of the 174-foot-long span, where two truss members were connected to the bridge deck. These design errors resulted in (1) overestimation of the capacity (resistance) of a critical section through the node comprised of diagonal member 11 and vertical member 12; and (2) apparent underestimation of the demand (load) on that same critical section. Additionally, the FHWA evaluation determined that the cracking observed in the node prior to the collapse is consistent with the identified errors. The investigation continues to examine the design, review, and construction processes as well as the actions taken once the cracking was observed. Test results showed that all the concrete core specimens obtained from both the bridge deck and the canopy met the compression requirements per the project plans. The design plans specified that the concrete used for the project was required to meet Florida Department of Transportation specifications. All specimens from both the bridge deck and the canopy were within the specified range for total air content. Two types of specimens were tested during evaluation of the post-tensioning rods: machined round bar specimens and full-size bar specimens. For all tension tests, the specimens met the specified minimum yield strength, tensile strength, and percent elongation at fracture. The steel reinforcing bars collected from the collapsed structure included several different sizes, identified as #5, #7, #8, and #11. Collapse-induced deformation of the size #7 bars precluded their testing. Tension test results for the remaining size #5, #8, and #11 bars found that all met the minimum yield strength, tensile strength, and percent elongation at fracture for their respective sizes. In summary, the concrete and steel specimens tested by TFHRC personnel met the minimum requirements specified in the project’s build plans. ​The information in this report is preliminary and will be supplemented or corrected during the course of the investigation.